Today is a historical day in Malaysia, my beloved country, where BERSIH 3.0 rally took place. Tens of thousands of Malaysians (we do not have the official finalized figure yet) turned up at all roads leading towards Dataran Merdeka today to voice up and protest: we want a CLEAN (Bersih means Clean in Malay Language) electoral reform, we want a clean government ruling the country, and we want change. Enough is enough, the whole world know how bad in shape this country is, and how desperate of a change we need to build a better nation. When I heard about this rally few weeks ago, I originally did not intend to be a part of it. However, as it grew closer to closer, I thought to myself, am I happy with the current state of my country. My answer is simple: NO. And I want change. No one can do this alone, and the people, the Malaysians will have to come together, make a stand, and make a loud statement. This will be a mark that turns history for Malaysia, and I don't want to look back many years from now and regret that I have not done anything. Yes, I want to be a part of this revolution, and yes I intend to play my part, no matter how small it may seem, no matter how insignificant it may be, as a photographer, to document this event, and share it out to the world, however far and wide I can reach through this humble blog of mine. I march in the rally with tens of thousands of people, as Malaysians. I fought as a photographer, and I will be showing you loads and loads of photographs taken from today's event. I know, deep down in my heart that, if I did not do anything, and chose to be ignorant instead, evil will win. I will NOT let that happen. All images in this entry were taken with Olympus DSLR E-5 and Zuiko Lenses: 11-22mm F2.8-3.5 and 50-200mm F2.8-3.5 Mk1 (non-SWD). No one wants LYNAS in Malaysia, so get the **** out. True Malaysia, desiring a better tomorrow. Together we stand. 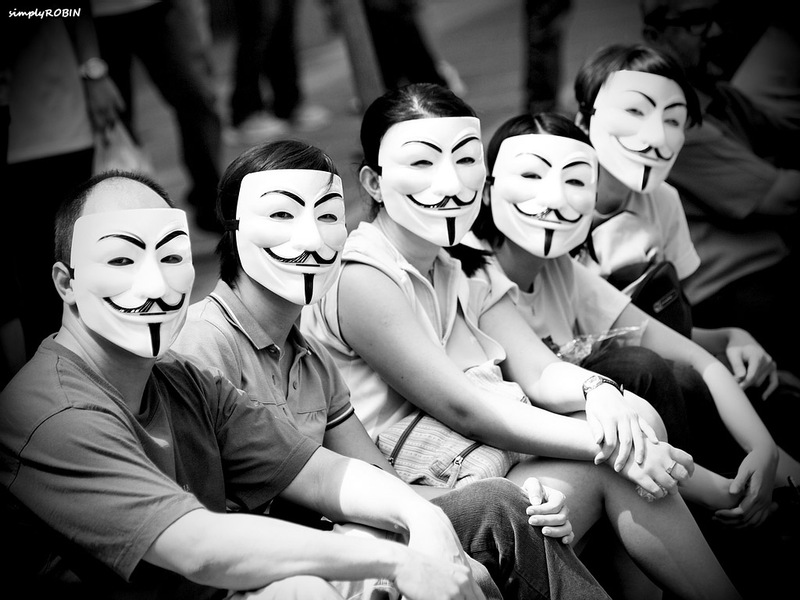 Inspired by V for Vendetta. Police barricading all entrances to Dataran Merdeka. Roads were empty, due to blocks. Therefore, I was joined by friends who have common goals: to see a better Malaysia. 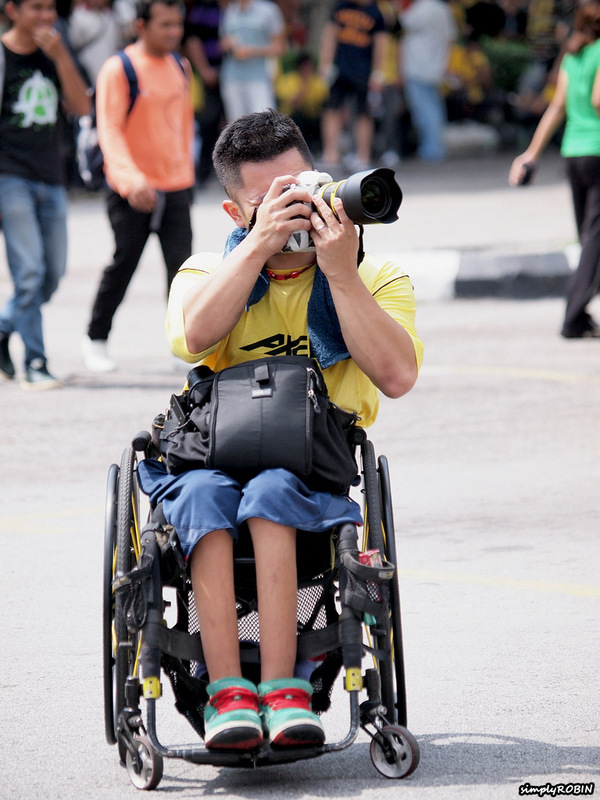 I have a friend, Luke Chua who was in a wheelchair, yet he was strongly determined to perform his best and work his camera magic, fighting our way through the impenetrable crowd. Talk about dedication and strong will, most of my friends who have no disabilities simply chose to sit quietly and idle their time away at home, while we were out there fighting the good fight. Besides Luke, I also had another friend with me, Eno Wong, who flew in to Kuala Lumpur from Kuching (across the South China Sea) for the weekend, specifically to join the Bersih Rally. 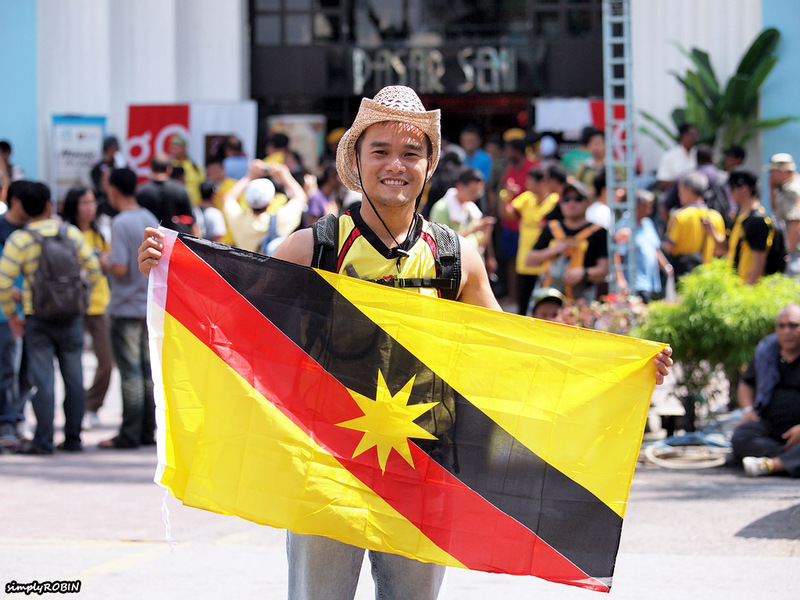 He proudly carried a Sarawak Flag at his back at all times. Having these two passionate friends with me added a lot more to my desire to shoot and grab more and more shots. We booked a hotel at Bukit Bintang and stayed the night before the rally, because we already anticipated difficulties coming into the Rally routes and locations on the actual day: there would be roadblocks, and public transport would be shut down.The city council did not approve the Rally (in this country freedom of speech is DEAD) hence, they make it hell for people who intend to make the rally happen. Staying in a hotel nearby the targeted locations saved us a lot of trouble, we could just walked to the locations after we checked out from the hotel in the morning. We started of by walking from our hotel in Bukit Bintang towards Pasar Seni. Our targeted first point was Central Market (near Petaling Street, or China Town in KL) and we originally wanted to join the crowd there and rally with them. When we arrived, a lot of protesters were already chanting loudly and singing patriotic songs. Little did we expect, Datuk S. Ambiga held a press conference just outside the Central Market, and I was in luck to grab a few shots of her. 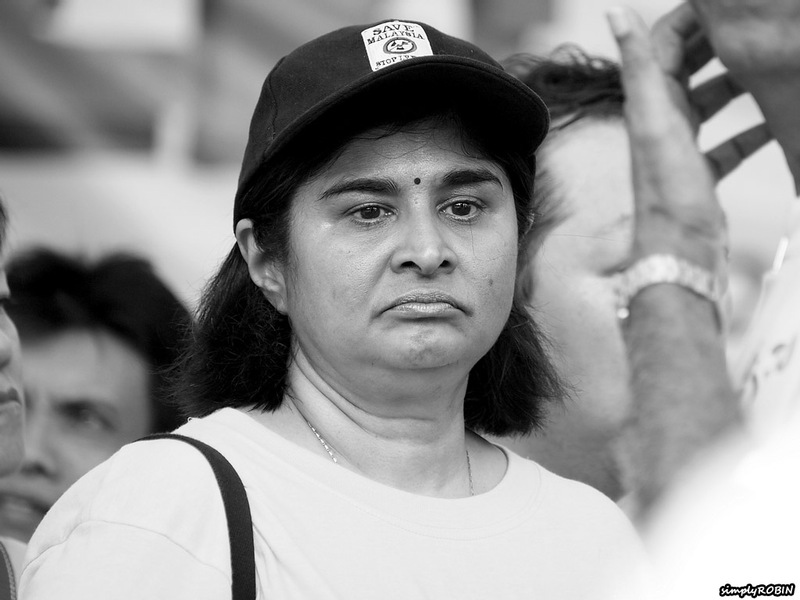 Datuk Ambiga was the lead and organizer of the entire Bersih event, with strong support from many local opposition party leaders. Datuk S. Ambiga, the leader for BERSIH, after holding a press conference at Pasar Seni in the early morning. She looked worried. Trying to calm the crowd, that dude is doing a great job. As the police vehicle passes by, they were being BOO-ed by the people. 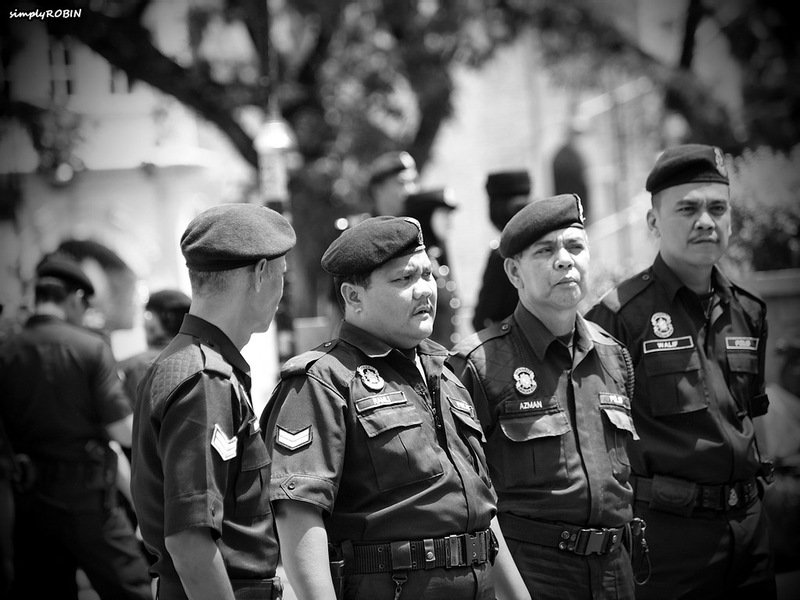 Malaysian police has very bad reputations of being corrupt and not serving the people's best interest. While we were at Pasar Seni, I bumped into quite a few familiar faces, including Ruby Ooi, whom I have not seen for a long time !! She too, was armed with a Canon DSLR, ready to attack the event. After Pasar Seni, we decided that we should not follow the huge crowd, and move out to Dataran earlier, to avoid the rowdy crowd that could get very messy. When we arrived at Masjid Jamek area, as anticipated, all entrances to Dataran were already sealed off completely. The police has set up barb wires surrounding the area, and the police force itself were on standby to retaliate in case anyone decided to breach and enter into Dataran. Nonetheless, that did not dampen the anyone's spirit, as we all grew larger and larger in number, as more and more people joined and flooded the surrounding areas of Dataran Merdeka. We may not be granted permission to use the Dataran as our protest ground, but the presence of so many Malaysians, all coming here for the same reason: that should send a strong and clear message, that we are NOT happy, and we demand CHANGE. After staying at one entrance location towards Dataran for a while, we decided we should change location and shoot from a different entrance. 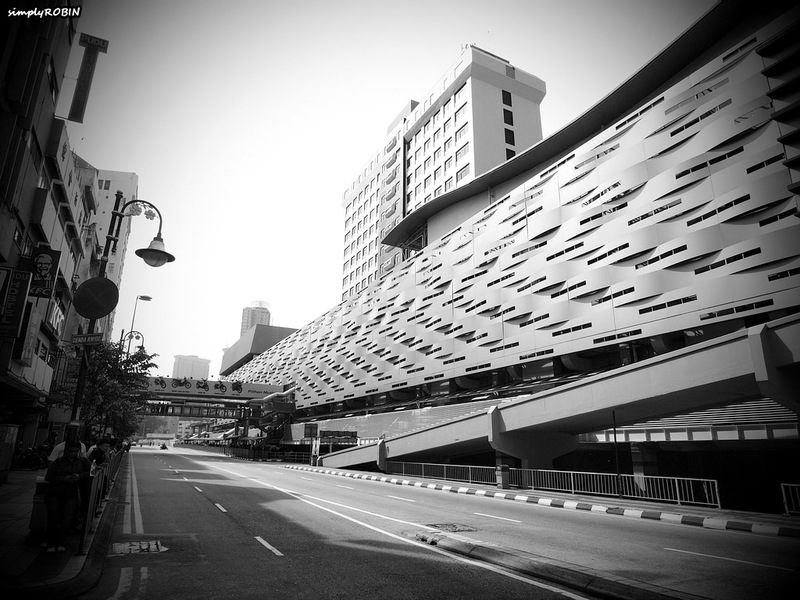 Hence we walked towards Masjid Jamek direction, and that was when things got very funky. That place was sardine jammed packed with people, everywhere !! There were times I was stuck in a spot and could not move for minutes. The amount of people was unimaginable, and that was the most hectic place of all, I dare assume. More and more photographs were taken, we slowly, but steadily, we made our way pass the unbelievably massive crowd and found ourselves very near to the front line. The only thing that separated us was the barb wires and policemen lining up, ready to pounce at victims who dared to cross their boundaries. Luke Chua, a GREAT photographer, who has inspired me recently. 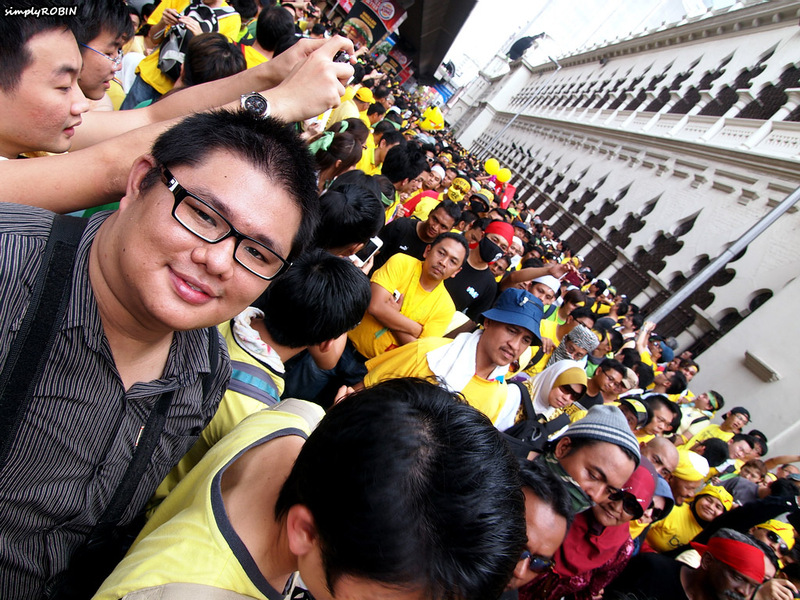 He was there at BERSIH. So what was your excuse for not being there? My Kuching friend, Eno Wong, who flew all the way to KL just for this event. He proudly carried the Sarawak Flag. I am proud of you my friend !! 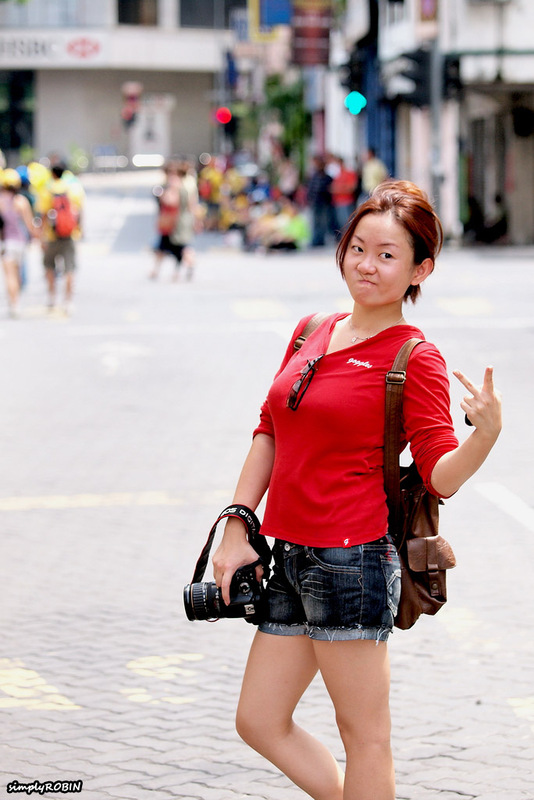 My nother friend, Ruby Ooi, whom we bumped into, and she decided to tag us along. Jason Lioh did not miss the party. Spotted many friends along the way too. Great to see everyone coming together. I agree, blood suckers !!! At the end of the day, all we wanted, was for the best of the country. Luke was given a gentle reminder by concerned fellow citizens that, when things get rough, we would be at a disadvantage, and when things get even uglier, we might not be able to do anything at all. Having safety as priority in our minds, we decided to turn back. As we were on our way out from the "hotspot", tear gas was fired towards the crowd, and that was when panic started to happen. Push became shove, and everyone started to force their way out of the crowded area. Although I was nowhere near the launch area of the tear gas, but it did get to me, and goodness gracious did it sting my eyes and noses so badly I thought I have stuffed myself with raw onions mixed with chilli and peppers. It was painful, tears streamed down my cheeks, and for that moment, for that brief painful moment I understood the pain of the people who were there, we all suffered together, we all were attacked by the Police. How hopeless were we? Through all the sudden panic, we all got separated. I found myself out towards Dang Wangi, hence I decided to call it a day. It was already 4pm, and we were out since morning 9am. I was tired, hungry, and hurt from the tear gas. My feet started to hurt from all the walking (not having a very comfortable pair of shoes either) and my mind gave up. Hence I took the train out of the hotspot and found my way home. However, Luke decided to continue shooting, now that is what I call true passion of a photographer. He went on further than most people did. I should make a blog entry dedicated to this incredible photographer soon. It has been a wonderful experience. I am glad, I made it there, and I am glad, I shot images. In the following slideshow, I have compiled 122 images, arranged in chronological manner. I did not want to flood this entry, hence for the rest of the photographs, please view the slideshow. My only request from you beautiful readers, is please, please share this blog and the photographs with your friends, and tell the world that Malaysia NEEDS CHANGE Tell the world that something is not right in this country, and that there is still hope. Because the people knows how wrong it is, and we want a clean reform. We want a clean election (no dirty tricks and phantom votes). We want a clean country, ruled by a clean government that truly serves the people. I may not be an influential leader, I may not do much, but I sure hope my photographs will do its job in telling the stories I want to tell. I sure hope that the anger, the frustration, the hatred and the burning desire for a better Malaysia will find their way to you all. I love Malaysia, and I will fight for it. Thanks for having me Luke. Sorry I forgot to link back to your blog. I shall do it now. We must shoot again in the future. Keep that shutter clicking, and share your passion with the world. You have a bright future ahead of you in photography. Yes, for CLEANER and better Malaysia. Hello Jason !! Thanks for stopping and posing for me. Terbalik or not, our spirit was there, and we love Malaysia. That I believe my friend, is above anything else, and truly matters for today. Thanks for bearing the flag ! A very beautiful image of citizens wanting a better Malaysia. Everyone, regardless of their race, religion or place of birth, deserves rule of law, democracy, freedom of speech and a transparent government. As a citizen of Sweden I have all of this, but the fight for the essential liberties is never over. Not here, not in Malaysia and not anywhere else in the world! May you win this fight! Thanks Rasmus !! Indeed, we should all keep fighting, for the better tomorrow. Thanks for reminding. Thanks NgeeJee. Did you go to the Kuching rally? Danny, it has come to a point that we all see the same thing: the country needs change, for ALL races. SO yeah, we all have to act now. Thanks for the kind compliments. I also wish the same here. Now you've REALLY taken your photography to another level, Robin. Congrats, much success in the changes that you and your compatriots are trying to bring about, and be careful -take care of yourself and your friends. Great images, as always! Thanks a lot Tom for the kind compliments. Do not worry, as an Engineer, I have always been trained to prioritize safety above anything else. Great set, even better message !! You were there? Yes, the tear gas is a horror. How I wish the police did not resort to such violence. Wow, you were there when the tear gas was fired. Admire you man, sorry to hear that you took a bullet. Hope you are fine now. I was from quite a distance away and I could barely stand the effect of it. yeah i'm quite fine, but i catch a cold a bit with runny nose...=)... It is really like a war though...running through thick tear smoke...gasping for the air like someone choking you....ugh...but honestly my tear is for my country...BERSIH!!!! Good for you mate !!! glad to hear you were fine now. Yes, the tear is for Malaysia !!! We were using Tooth Paste...yes "Pasta Gigi"-here in Jakarta back in 1998- to ease the effect of tear gas. I don't know if its working now--with different tear gas formula ;)-- we just spread it on our upper cheek/below eye and under your nostril.. Thanks for the good tips !! Will sure come in handy the next time around. Glad to know that you got your OM-D !! Oh dear, 400 shots is indeed not enough. I guess a spare is needed. But I do think that the battery capacity is better than it was before on any PEN cameras. But still can be improved. The above series is a very powerful portrayal of People Power.As an outsider who has visited your country briefly in the past few weeks I am pleased to see that your citizens have the willpower to fight for the betterment of themselves and their beautiful country.. Thanks for being there and and bringing out these ever so powerful shots to show the outside world "POWER TO THE PEOPLE".. May the voices of many Power the few in control to do the right for all.. Regards Ian Mac in Sydney. Thanks so much for the kind words and support, it means a lot. You were right, the voice of the people must be heard, and we Malaysians will have to fight for our own. thanks for the well wish, now please help to spread the awareness around! The world needs to know the truth! Yes, I'm telling my friends about it. There're people that I know proclaim they're "neutral" and choosing to be staying at home and posting on facebook instead. He has commented the rally turn into violent and this Bersih 3.0 idea is just isn't right. Seeing your documentary and even disable citizen like Luke is participating in this event, I really do not know what's not right about it. We are all Malaysians, and we all have enough of what was being thrown at us. Do not believe in what you listen from Media or those "neutral" people, they were not there with us, and they did not go through what we did. What you read there was probably over-sensationalized, or just ideal opinions with nothing to be based on. We were all harmless, peaceful people, protesting and voicing up our frustrations. My photographs do not lie, and I believe you have seen the truth through them. Well done Robin, for being counted and documenting the event. I hope this won't be the end of the noise-making. Malaysia has improved in the more than 20 years I've been traveling there, but it still has a long way to go. The big difference I see now, is that people of all races are fed up with the inequity of the "system". Many Malay friends are today embarrassed that they received grants and scholarships that were simply not available to Chinese and Indians. Talking about it will help bring change. Malaysia, we hope, is not Syria. That said, many Chinese I know still have a grave fear of the May 13th, 1969 incident repeating. Keep this in mind when judging fellow KL dwellers, as their parents will have vivid memories of the atrocities of those times! Although the good folk in your photographs aren't armed, they will be viewed as very dangerous by the incumbent government. Nothing is more vicious that a cornered rat, and when you have a government full of such creatures.....all involved need to be careful! Thanks for the kind words, Tom. Your support and encouragement are really appreoiated. Indeed, more and more people are speaking up, and acting now, and we are starting to put our differences behind us. Government may see us whatever way she wants to, but we are her people, and we have to fight for our rights. Without us, there is no government in the first place. Anonymous comment will not be allowed, especially if your comment does not make any sense. amazing set of photos you have! It's really great to see people of all ages, of all races coming together for this cause, BERSIH. I really do believe there is hope for us yet. Why else would so many of us sacrifice a whole Saturday? Thanks for the kind words Andrea. Indeed, Malaysia is different now, people from all background, come together as Malaysians, putting aside our difference, with hope for a better nation. I used to study in Australia too. Glad that you have done what you could there !! Hi, Robin, Great write up and amazing photos. I'm Scottish, but live in Germany. Take courage from the peaceful `Monday Demos` in East Germany, which led to the fall of the Communist government and the opening of the Berlin Wall. Remember Ghandi: First they ignore you, then they laugh at you, then they fight you, then you win. Thanks for the support and encouragement !! Appreciated much. Great photos Robin! I admire your dedication. I encourage all malaysian around the world to raise up and support this movement to make a different to a better malaysia. Time for a change and fight for our right as a malaysian born and breed other then just BUMI etc:-) Let get rid of this old corrupt regime. 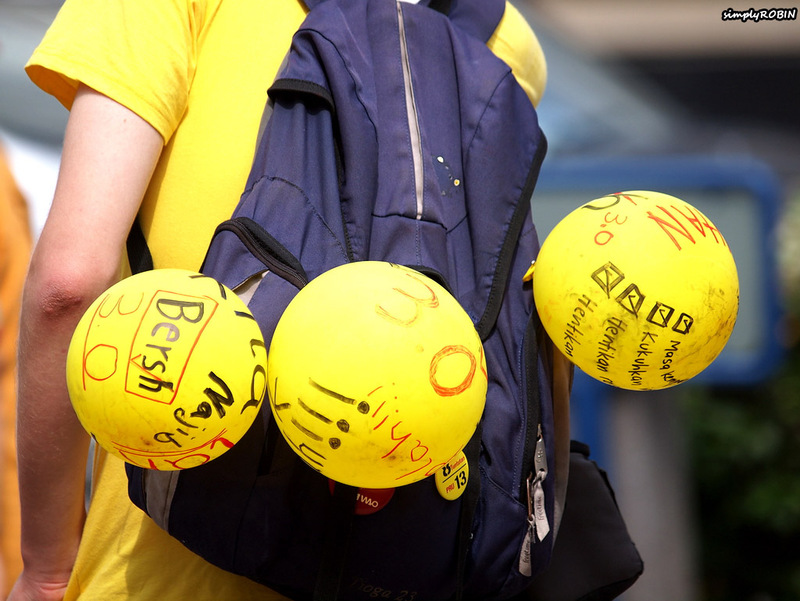 Go BERSIH :-) You get all my support. Please leave a name when you comment next time. Thanks for the support, and yes, we need to make the change happen, only when all Malaysians unite. Great shots from KL - really captured the feel of the event. That feeling of Malaysians coming together regardless of age, creed, gender, race or religion. That true feeling of 1Malaysia. Thanks Darren. That was what I wanted to Portray, Malaysia, a nation built on people, real people. I admire the courage of your people. I wish we found that courage in Vietnam. Thanks Analogic !! I am sure sooner or later people will rise up and fight for whats best, anywhere in the world, when desperation calls. Be brave. Robin, thank you for sharing the photos. They are incredible and captured the moment. I left Malaysia in 1993 and became a US citizen last year. One of the big reasons I abandoned Malaysia is because of the institutionalized discrimination and rampant corruption in the system. I am heartened to see that others realize the inequality in Malaysia and are fighting for change. While I no longer have "skin in the game" I wish you all the best and hope that you will be able to change the system for the better, for all Malaysians including my family who are still there. Thanks Peter, for the kind words. Glad to see that though you are in greener pastures, you still look back and care for Malaysia. We all hope for the better tomorrow of Malaysia. Thanks again for the show of support and encouragement. Thanks for the support Wolfgang. I am really proud of you, as a fellow friend and Malaysian. I still remember you said you didn't want to go back Kuching to cast your vote and your one vote will not make a difference. It was disappointing to hear that, especially as a fellow Malaysian. Today, with your entry on Bersih 3.0, you did your part, with your own method and I am proud of you. Hopefully you will fly back to Kuching to vote during the next election. Your one vote, does make a difference. Really. Not voting is only giving the evil less one person to defeat. Cheers mate. Will see what happens this coming election. Should be quite interesting. Well done, Robin. Good evocative pictures with a real message. Keep up then good work! Thanks Peter !! I did my best for my country, in whatever small ways I can. Go ahead, and spread the word !!! Awesome photographic journalism. Your pics are infused with drama and humor. Excellent series yet again! PS. 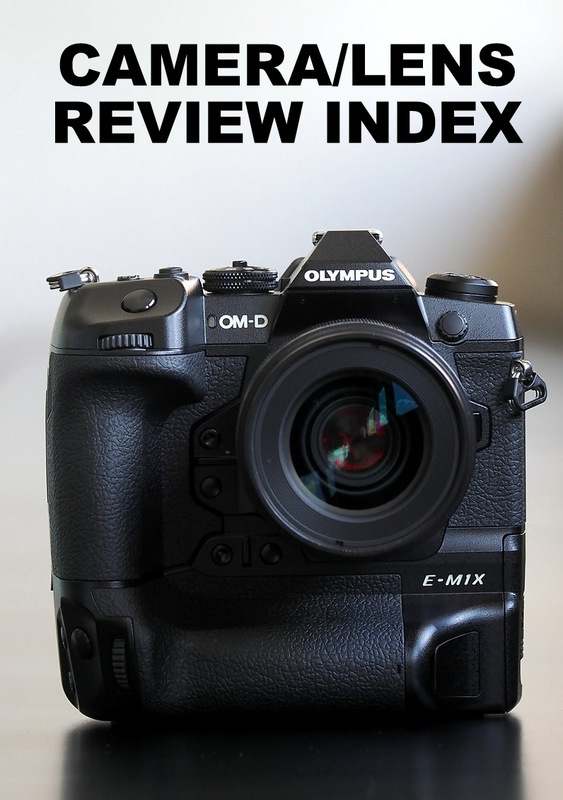 Just in case you haven't seen it...check out the Dpreview website for their latest camera review. Thanks Eric for the kind compliments. Yes I have seen the DPReview !! Gold award, finally, Olympus deserves it. I have visited Malaysia many times and have many Malay friends here in Australia. It always amazes me how such a friendly country and wonderful people have a truly lousy government. I hope that the people of Malaysia finally get the government they deserve. Thanks Paul for the kind words on Malaysia and its people. I agree with you, its time we have a government that we deserve. Thanks for the support. It's scary when the police are fat and the people are thin. But long term, the thin will outlast the fat. I don't know how to pronounce bearish. But it sounds like freedom to me. That is a great observation you have there. Truth will never escape the photographs. Hence photographs are powerful. Bersih means CLEAN. We want a clean election. We want a clean country. Wow! Wow to the Malaysians for standing up and speaking out. Wow to you and your fellow photographers for excellent reportage. Inspiring work! Thanks diforbes. We are fighting the good fight. Hope for the best. Wow some great photojournalism here. Ananda Sim sent me here. I haven't really seen many photos from Malaysia. I am sharing this with my fellow Malaysians. Thanks for the kind compliments, and thanks for sharing !! Spread it around please ! Thanks for the support Robe. Great story and wonderful pictures. Robin, you really have a talent for documentary. Being German, i know that people can change a lot, if they persist and remain peaceful. I'll keep my fingers crossed for you and your fellow Malayans, stay safe please, violence changes nothing. Thanks for the wise words and encouragement, we all need that. And thanks for sharing this entry around, really appreciate your help. Read and understand: human rights and the rule of law, not men, are not negotiable and not something only for the rich. Corruption is one of the fundamental evils of this world, but no one has to accept that things cannot be changed. More power to Robin and all the Malaysians who want clean and honest government! Thanks John for the show of support !! It means a lot to me ! Robin, terrific article and photos, good for you! Right is right! Thanks for the kind words. Indeed, right is right !! Thank you for the beautiful photos and ur contribution. It was my duty and responsibility as a Malaysian, so no worries. Glad that you are OK. Brave of you being there, I wonder if my country people will dare to raise up like this, me included. Beautiful photos, right in the middle of the action! Thanks SimLim. I am sure when things get desperate people will stand up and fight for whats right. Great images. I support you and the "real" Malaysians in seeking a cleaner government in this country. I really wanted to join the march myself, but in the end I did not because I felt that, as a non-Malaysian, I did not have a right to. Also, I might have gotten fired from my job (I work for a company contracted to the Malaysian government). Anyhow, I hope these marches gain strength each year and help to reduce the amount of corruption and incompetence I have witnessed here. Your show of comment here is enough to show your support. There is no need for you to risk your job and your safety to be present on the actual protest, it is understandable. Thanks for the encouraging words, and thanks for your constant support here in this blog. It is appreciated much !! Powerful images! Also thank you for mentioning Luke Chua - his work is amazing as well... All the best. Thanks Brad. Luke is a great photographer, and strong willed person. Will be seeing more of him here. Well done Robin! Moving and beautiful photos and testimony. I'll share on FB. Don't give up the fight for justice and freedom. May the Grace be with the Malaysian people. Warm regards from Paraguay. Thanks for the support and encouragement ! I am surprised to find you here !! Glad to have you in my photograph. 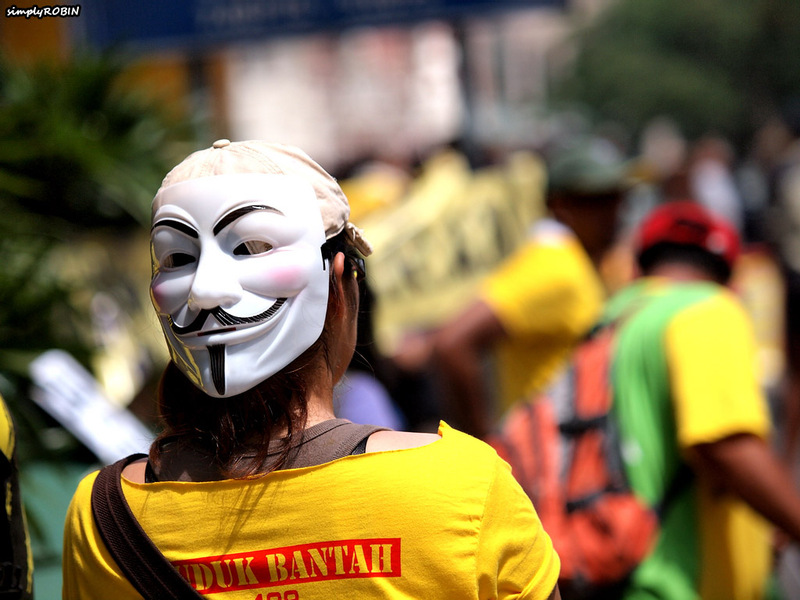 The V for vendetta mask is a very strong symbolism, great to see many people wearing it for the BERSIH Rally. the group actually credited you for your blog and despite what my officemates will say, i'm keeping that pic on my fb wall. rally on, my friend! rally on! looking forward to your other updates! good job there bro robin..
Great pictures Robin. Getting rid of the current regime may seem like its the hardest thing but keeping clean after the change is harder - we South Africans can testify to that. Go for change but be vigilant afterwards. Good luck. Allan Jackson. Thanks for the reminder Allan. First step has to be taken, and we shall worry about after the change, after the change. Hey Robin! 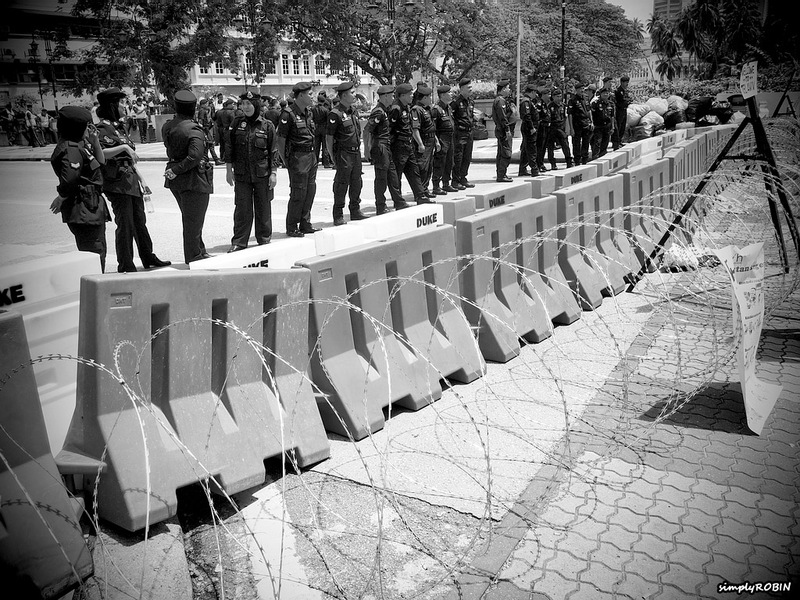 did you grab any shots of the barbwire around dataran? that would be a 2012 photo of the year so far. truly a sad day for our country when the government sees fit to throw a ring of barbwire to stop citizens from doing what is their inalienable right, to assemble in a public space. You can find some shots of barbwire in the series above. No, this was not a sad day. Government making wrong decisions, yes, all the time, that is nothing new. But what BERSIH accomplished, bringing 300,000 people together, united regardless of race and religion, age and class, that my friend, is truly something to be celebrated and be joyful about. Malaysians are finally Malaysians, we put aside our differences in hope for a better nation. Great photos Robin... I believe you will be part of Malaysia history at least through your lens. I will pray for Malaysia yang lebih bersih. This remembering me back to 1998 when we need a clean goverment here in Indonesia, I know we still struggle for fightiing with many corruption here and there. But we believe we are on the right track, so is Malaysia. Even now, president's laws can be brought to jail when he was suspected to the corruption. We can bring governor, minister, military general, member house representative and many to the jail because of the corruption or other abuse of power. And it was impossible until 15 years ago. Keep spirit for Malaysia Bersih! thanks for the kind encouragement Rudi!! indeed we must fight for a better country. no doubt we cannot prevent any government from conducting any wrong doing but if the people do not agree with how the government runs things we have to stand up and speak up. I wish you and your beautiful country well too !! Powerful images, Robin. Thanks so much for sharing them. As an Indonesian now living abroad I've seen the pain of my home country going through reforms. I don't know if Indonesia is in any better shape than Malaysia is now (we were in terrible shape before the reforms and honestly have a long way to go), but I do know that these things take time. 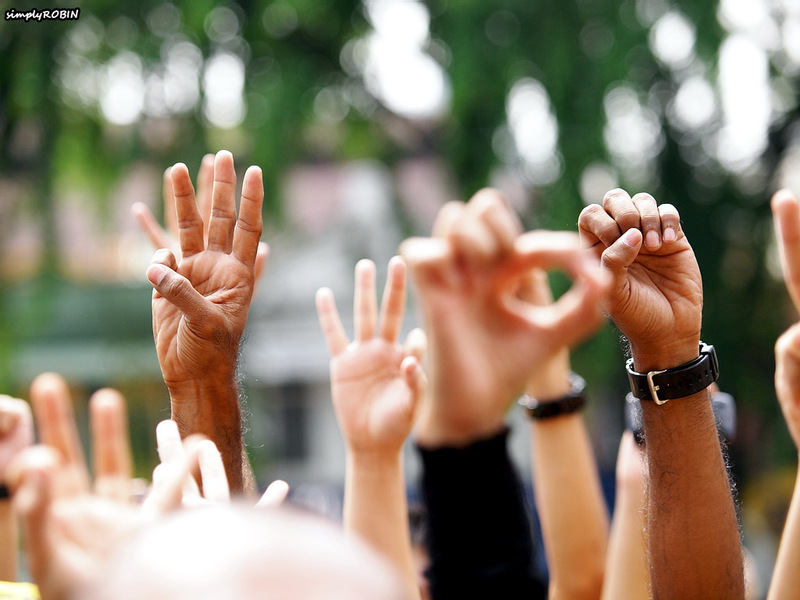 I pray that you and your fellow citizens would have the strength and patience to continue to push for change. As you said, if you don't act then who will? Thanks for the kind words, encouragement and also your prayer. I really appreciate them. Indeed, if we do not act, who will? This is our country, we have to fight for it. Great set of photos. 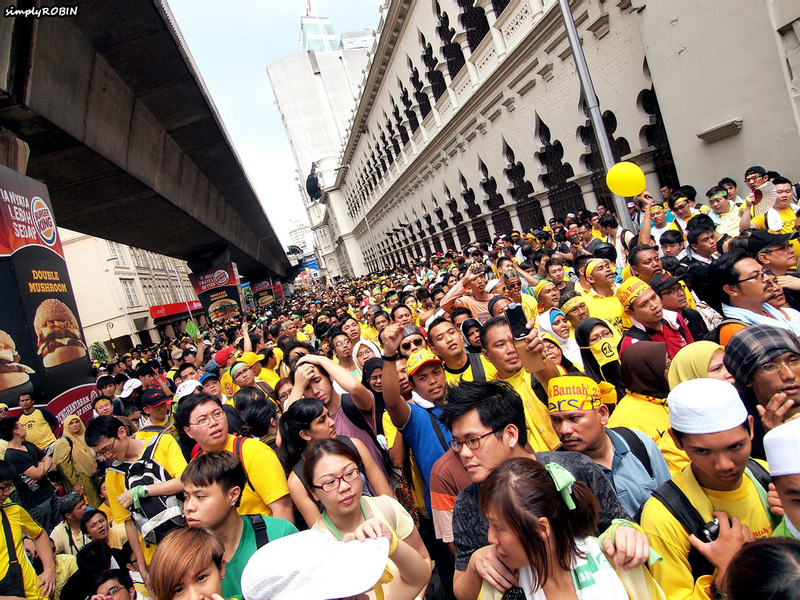 The biggest difference I can between the Bersih marches now and the Reformasi marches of 1998 is that the Bersih marches had more non-Malays. In fact, in many ways, the Malaysian public have grown up a lot and the non-Malays have shed their apathetic ways. Well done Malaysians! 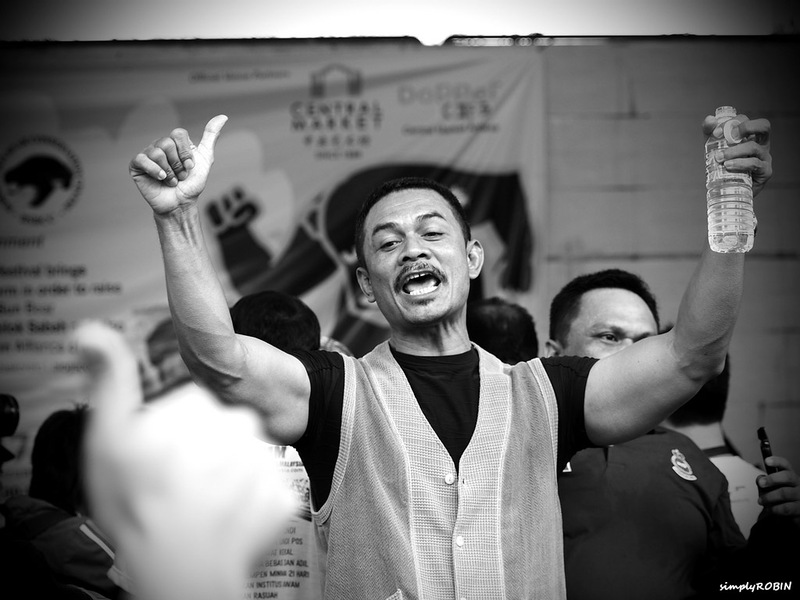 Compare to the 1998 Reformasi marches which were mainly Malays and which were basically very political in nature, a matter of disowned apprentice fighting against his master, Bersih marches have managed to be apolitical in many ways. 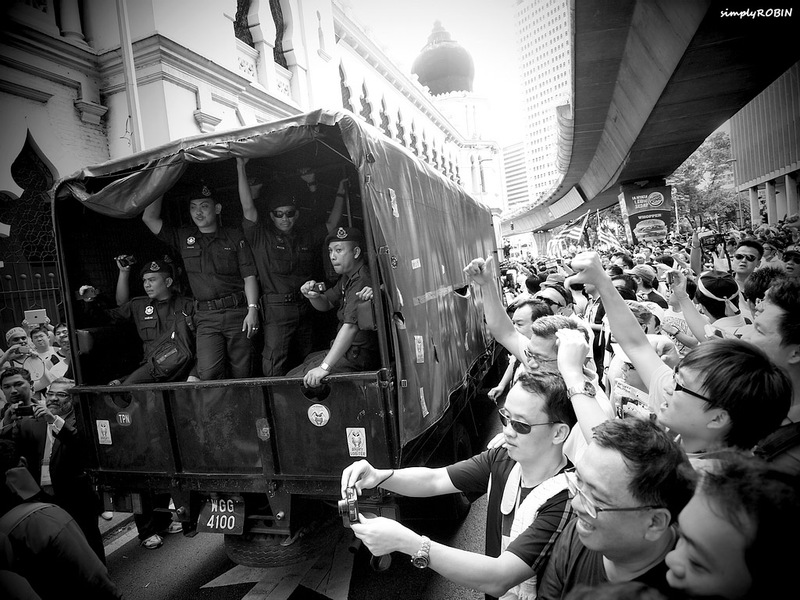 The Reformasi marches in Kuala Lumpur in 1998 were not only Malay dominated but frightened the Chinese no end. 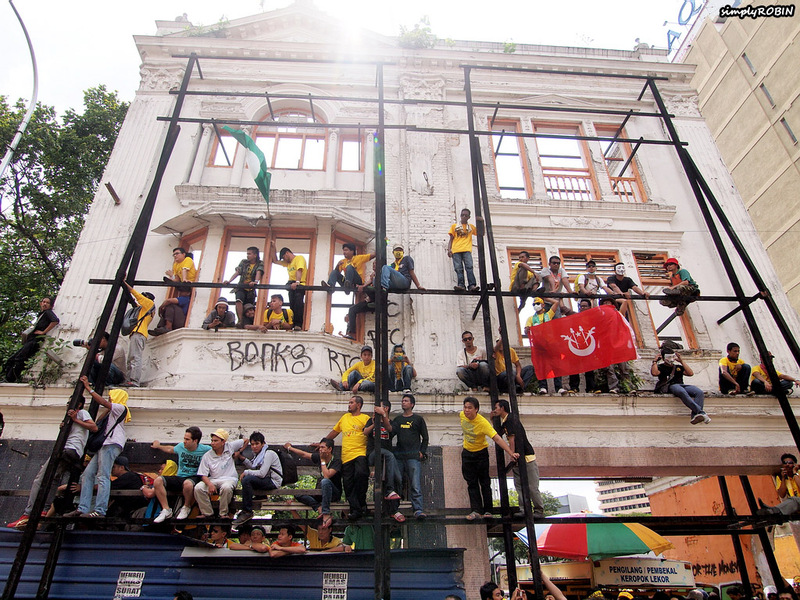 I can still remember one particular march which whether by design or mistake, started heading towards Chow Kit Road. For those who do not know the significance, Chow Kit Road is Chinese dominated and also the flashpoint of the May 13, 1969 Race Riots. Within an hour, all Chinese businesses, offices and shops were closed down as everybody after hearing the news, shut up and fled the area. My office immediately closed and everybody quickly left for home. Luckily, nothing untoward occurred but I think many KL residents who are Chinese would still remember the chilling effects of the Reformasi marches in 1998. 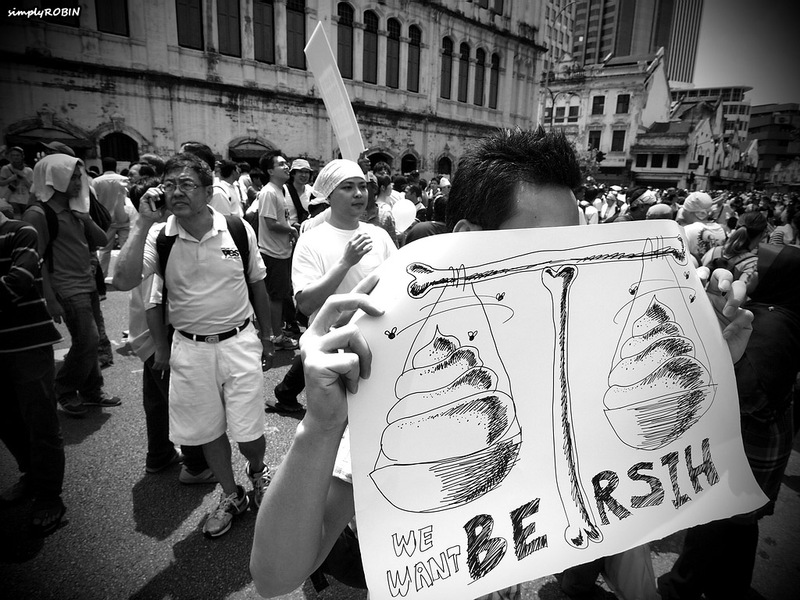 I am glad that Bersih is so different and in many ways, have achieved its aims, if not immediately, slowly and surely. Thanks for the kind compliments and thanks for sharing your thoughts and experience on the reformasi with us. I was still too young at that time (only in form 1) and everything seemed vague. Nonetheless you were right, things are different now. Somehow we all do not fear each other in the crowd, and all different races came together and walked together in unison. fact enjoyed account your weblog posts. Any way I'll be subscribing on your feeds or even I fulfillment you get entry to consistently quickly.